Graduated from Institute of Chemical Engineering and Technology in 2003 with B.Sc Engineering in Metallurgy and Materials Science. Worked as Production Engineer in WAVES Cool Industries of Pakistan from October 2003 to March 2005. 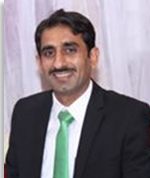 I was appointed as Junior Engineer PITMEAM, PCSIR Lab Lahore from April 2005 and also completed my M.Sc Engineering in Metallurgy and Materials Science from Institute of Chemical and Technology University of the Punjab Lahore in 2007. I was appointed as Lecturer at Institute of Advance Materials Bahauddin Zakariya University Multan in July 2007 and worked there for two years. I awarded a graduate assistantship scheme in Universiti Teknologi PETRONAS Malaysia for PhD in February 2009 and completed my in 2012 from same University. Working as Assistant Professor at Department of Metallurgy and Materials Engineering, CEET, University of the Punjab Lahore since September 2012. My area of research is as: Powder Metallurgy, Nanocomposites, PMC, MMC CMC and Hybrid composites. Published thirty research articles in international reputed journals. M.Sc. (Engg.) Met. Engg., P.E.